Isotopes: There are 36 known isotopes of gold ranging from Au-170 to Au-205. There is only one stable isotope of gold: Au-197. 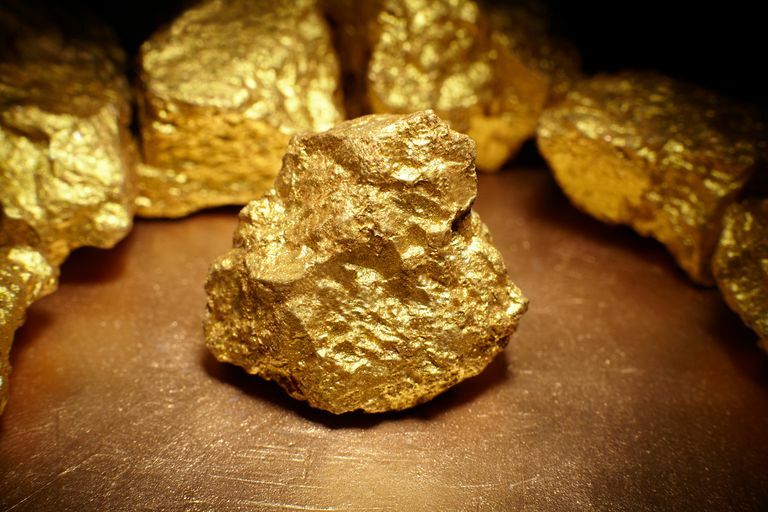 Gold-198, with a half-life of 2.7 days, has been used to treat cancer and other illnesses. Oxidation States: 3, 1. The oxidation states -1, +2 and +5 exist but are rare. In mass, gold is a yellow-colored metal, although it may be black, ruby, or purple when finely divided. Gold is a good conductor of electricity and heat. It is not affected by exposure to air or to most reagents. It is inert and a good reflector of infrared radiation. Gold is usually alloyed to increase its strength. Pure gold is measured in troy weight, but when gold is alloyed with other metals the term karat is used to express the amount of gold present. Gold is used in coinage and is the standard for many monetary systems. It is used for jewelry, dental work, plating, and reflectors. Chlorauric acid (HAuCl4) is used in photography for toning silver images. Disodium aurothiomalate, administered intramuscularly, is a treatment for arthritis. Gold is found as the free metal and in tellurides. It is widely distributed and almost always associated with pyrite or quartz. Gold is found in veins and in alluvial deposits. Gold occurs in sea water in the amount of 0.1 to 2 mg/ton, depending on the location of the sample. Gold is one of the few elements that can be found in its native state. Gold is the most malleable and ductile metal. One ounce of gold can be beaten out to 300 ft2 or stretched into a wire 2000 kilometers long (1 μm thick). The melting point of gold is an assigned value, which serves as a calibration point for the International Temperature Scale and International Practical Temperature Scale. The gold ion in the +1 oxidation state (Au(I)+) is called the aurous ion. The gold ion in the +3 oxidation state (Au(III)3+) is called the auric ion. Gold is one of the noble metals. Noble metal is an alchemical term for metals that do not corrode under normal conditions. Gold is the seventh most dense metal. Metallic gold has no odor or taste. Gold has been used as jewelry since prehistoric times. Today, gold in jewelry is not 'pure' gold. Jewelry gold is made of many different gold alloys. Gold is resistant to most acids. The acid aqua regia is used to dissolve gold. Elemental gold metal is considered non-toxic and occasionally used as a food additive.